Released December 2012 by AFM Records. Guitar solo on "Birth of the Starchild" by Ryan Knight. Guitar solo on "What the Future Holds?" by Jona Weinhofen. Drums recorded by Teemu Heinola at Ansa Studio, Ulvila, Finland. Guitars recorded by Thomas Johansson at The Panic Room, Skara, Sweden. Bass recorded by Teemu Heinola at Ansa Studio, Ulvila, Finland. Vocals recorded by Thomas Johansson at The Panic Room, Skara, Sweden. Mixed by Thomas Johansson at The Panic Room, Skara, Sweden. Mastered by Thomas Johansson at The Panic Room, Skara, Sweden. 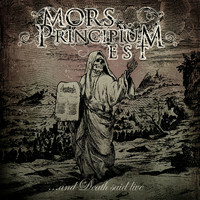 Produced by Mors Principium Est. Vocal sessions produced by Ville Viljanen, Thomas Johansson & Andhe Chandler. Artwork & design by Jan Yrlund@ darkgrovedesign.